By the time you set foot in Draenor next month, when World of Warcraft’s Warlords of Draenor expansion goes live, you’ll basically be one of the most important people in the universe. Your list of feats will include travelling to different worlds, tackling the Burning Legion, the Lich King, Deathwing and saving the world of a daily basis. Despite all of this, you’ve been a slave to the whims of others. You’ve never been put in charge, constantly performing tasks for quest givers, even if they are clearly inferior to you. With Garrisons, though, you’ll finally get a taste of what it feels like to order people around. Today, Blizzard’s spilled the beans on how you manage your minions. The moment your barracks are up and running, you’ll get your first follower. From there, you can collect as many as you like, building up an army of NPCs to do your bidding. There’s a limit of 20 – or 25 if you upgrade the barracks – active followers, but inactive ones can be kept around and won’t lose their progress. Oh yeah, progress. Followers can level up, all the way to 100 – just like you – and they’ll become more powerful as they work their way up the ladder. But don’t start thinking of them like real people – they are tools, living, fleshy gear for you to boss around to your heart’s content. And like gear, they come in different rarities, from common all the way up to epic quality. The rarer they are, the more abilities and traits they’ll posses. Follower progress doesn’t halt at level 100, though. After they hit max level, they’ll keep gaining power, but instead of that taking the form of levels, they’ll increase in rarity. Their traits and abilities will inform how you use them and what tasks you assign to them. You’ll want to chuck followers with profession bonus traits into specific buildings connected to those professions, while your combat focused minions should be sent on missions. Different classes will be better at dealing with different missions, too, so it’s not a matter of just throwing any old adventurer at any old quest. Just like your own quests, there will be problems that can’t be tackled solo. Followers can be sent out in groups, and again their traits come into play. One such trait type is racial preferences, as certain followers might get along better with members of specific races, and teaming them up will increase the odds of success. Maybe your new orc buddy has a bovine fetish, so you should send her out with a tauren chum. Bodyguard followers sound particularly handy, as they are essentially powerful combat pets with a few big restrictions. They’ll follow you out into Draenor and help you as you work your way through the quests. And just like Kevin Costner, they’ll start to develop feelings for you, gaining a new ability as you become closer. They won’t be able to join you in battlegrounds, instances or scenarios though. 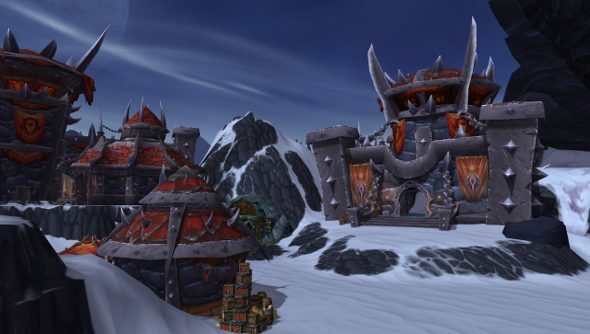 Warlords of Draenor launches on November 13th, and then you’ll be able to build up your own personal people ranch.